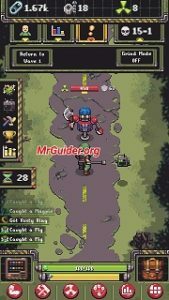 Idle Wasteland is a unique incremental game for mobile by Alex, published by Iron Horse Games. In the game, you will hunt the creatures, explore various zones, collect the scraps, craft unique items, and try to unlock all the locked features. If you have just started playing it and looking for a guide, some tips, then our today’s Idle Wasteland guide and Idle Wasteland tips will help you to progress fast. Let’s dive in! ⇒The battle system is easy to understand. Your character deals damage to the enemy as soon as the yellow bar gauge fills. You can fill the gauge fast by tapping the screen. The same rule is followed by enemies. The enemy attacks the character as soon as the yellow bar gauge fills. ⇒The maximum damage dealt by the character depends on the strength level and strength upgrades. You can raise the strength level by killing creatures and buy strength upgrades with currency. ⇒At the top-right corner, you can see the stage progress. At the end of the stage, you will fight against the stage boss. Unlike normal waves, In the boss fight, there is a fixed time duration within which you will have to defeat the boss, otherwise, you will not be able to progress to the next stage. Suppose, enemy’s armor is 150. And, the armor penetration stat is 75. So the enemy is now left with 75 armor stats(150-75). 75 armor means hit block rate would be 75%. At the top-left corner, tap the character icon -> here you can see the armor penetration stats. You can increase these stats by leveling up armor penetration upgrade or buying armor penetration upgrades in the strength menu. ⇒When the enemy attacks, you will get stunned. Upgrading the suit will grant you resistance stats which may help you to not to get stunned. Go to the crafting menu -> at the top, head to the third tab -> upgrade suit. The character has five main skills; strength, salvaging, crafting, biomagic, and hunter. Strength skill helps the character in fighting with creatures. Crafting skill lets you craft unique items such as auto salvager, armor penetration, craft timers, and more. Salvaging skill lets you craft raw material(required in crafting items, upgrading suit) with the scrap. Biomagic skill lets you discover new spells. Hunter skill lets you capture and discover new creatures. Tap the skill graph icon at the top -> here you can check the skill level. Just below the skill level numbers, you can see the EXP bar. Follow the above-mentioned steps to gain skill EXP and level up skill. To unlock new boosters or things, you will have to prestige. That’s the only way to discover hidden things. For example; to unlock new spells, flying creatures, items. Once you reach a certain skill level, you will be able to prestige. When you trigger the prestige, you will start from the wave I, that skill upgrades will reset, currency amount will also reset. The positive things are; prestige level will increase and new content will get unlocked, you will earn prestige currency + skill boost(for example; prestige strength grants damage boost, currency boost). Bottom menu -> 5th tab(Prestige) -> expand -> here you can see lose & gains, new unlockable content. There are two skill trees in Idle Wasteland; regular skill tree, super skill tree. You can unlock regular skill tree bonuses using regular skill points and super skill tree bonuses using super skill points. Regular skill points – Earned every 5th wave milestone(5, 10, 15..). Super Skill points – watch video ads or get from the store. Nuclear Material is one of the rare in-game currencies in Idle Wasteland. You can earn it by watching the video ads, killing monsters, from the environment, achievements. You can use it in various things; powerful upgrades or boosters, in resetting skill tree, to return to wave I. Every zone offers a special boost. For example; In the forest zone, the creature spawn rate increased by 25%. As you clear more stages, you will unlock new zones and teleport from one zone to another. Tap the menu button at the bottom-right corner -> world map -> tap the zone point -> at the top-left corner, tap the zone name. You will earn task tokens upon completing a task. Use these tokens to unlock permanent boosts. Go to the menu -> task reward -> spend task tokens. So this would be all for now as Idle Wasteland guide. Let’s take a look at our quick Idle Wasteland tips. ⇒Kill the monster and they will drop an item that you can use to gain a temporary boost. All the items dropped by the monsters are collected automatically as you kill that creature. Tap the bag on the bottom-right side -> tap the item -> use. ⇒You should activate the spells when fighting against the boss(if it’s powerful). To cast the spell, you need mana. Mana regenerates by 1 every 20 seconds. Spells such as damage boost, attack speed boost, critical hit rate boost helps you a lot in the boss fights. So make sure to activate at the right time. At the top menu, tap the quest(i) button -> here you can see the current task. Complete the task to earn task tokens, nuclear material, and many more items for free. You can spend task tokens on permanent upgrades. Prestige pushes you back to the stage I, but you will gain access to new features, boosts. Make sure to prestige all the character’s skills from time to time. So these are the top basic Idle Wasteland tips for the beginners. If you have more tips to share, comment below!